Using my telephoto zoom lens I was a fair distance from the geese. They got nervous of my movements and went into flight. Nice shot. The geese around my local park are so used to people that not much spooks them. They often parade their young out of the pond and settle them in the grass for a snooze just a few yards away from where I'll sit. Wonderful creatures. Hilary... 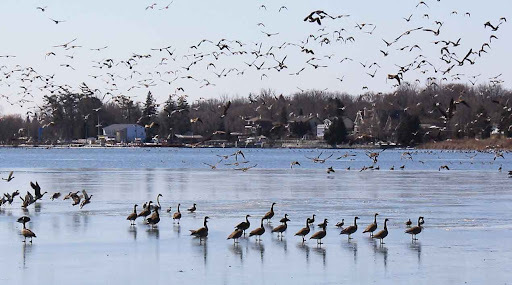 I think the geese are more vulnerable and watchful when on ice. It makes it easy for foxes and coyotes to reach them. Whether it was you who spooked them or not, this is a wonderful shot of the geese, Andy. there were certainly enough of them to start a mob flash.